Hooves laced with steel seemed to come at me from all directions as a coal-black stallion named Midnight Merlin ripped the lead rope out of my hands, bucked, whirled around, and lunged at me, rearing, striking, raging at a ghost. All I could do was hold my ground and pray that I was fierce enough to win his trust. “I don’t want to be this strong person,” I kept saying over and over to myself, fighting the urge to run screaming out of the arena as the previously-abused horse attacked me once again for no apparent reason. To contain this violence, I would need to tap a form of power I wasn’t even sure existed. But first I had to get over my resistance to the by-then-blatant fact that gentleness, sympathy, and understanding couldn’t begin to heal this savage, wounded force. Not only did I survive the ordeal, I was deeply transformed by it. And in doing research for my fourth book over a decade later, I realized that gaining the trust of an angry stallion was an ancient power story, one that predicted greatness. But what did it mean? What skills and intrinsic personal qualities did this archetype promote? Alexander the Great outshone his father’s officers in gentling the unruly Bucephalus, a spirited horse who subsequently carried his one and only master through numerous conquests. Similar stallion-taming tales are told about Siddhartha Gautama, who later became the Buddha. In his case, the equestrian arts (which most royals employed for pageantry and war) exercised an expansive, non-predatory power, one that developed mindfulness and poise in the midst of chaos, giving him tools he would need to leave his privileged life and pursue enlightenment. In my case, a hard-won combination of fierceness, courage, compassion, mindfulness, and emotional agility allowed me to break through Merlin’s horrific defenses. 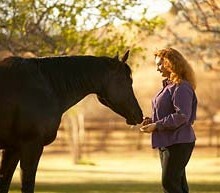 The stallion literally tuned me, upon the threat of death at times, to access a long-ignored, yet incredibly effective alternative to dominance-submission, fear-intimidation, command-control forms of power. In my new book The Power of the Herd: A Non-predatory Approach to Social Intelligence, Leadership, and Innovation, I offer significant historical and scientific evidence to show that non-predatory power is nothing new, though it has been downplayed by conquest-oriented civilizations, including our own. It exists in nature, most dramatically when large herbivores engage in heroic, altruistic acts to protect vulnerable herd members. Non-predatory power has also been modeled and actively promoted by religious leaders like Lao-tzu, the Buddha, and Jesus. Centuries later, it was employed by George Washington—helping him to win the Revolutionary War against a much larger, better trained, well-funded, intensely predatory British Army.